You should know that I really do not like Subject Lines. What is going to grab the readers attention to ensure that they will click on your note? I have no idea and if we're being honest, it makes my brain hurt to think about it. Hopefully, today's subject was the perfect thing to peak your Friday afternoon curiosity! I really am having "all the feels" and squealing...can you see it? Good! I will be sending this out to those connected to Grace's Table next week, but wanted to celebrate with you today. You are the ones who showed up on a week night, last August, to pray for the families and future of Grace's Table. If you haven't heard, the construction of the basement is underway and you're all invited to come check it out and celebrate how God is answering the prayers you prayed last summer. In preparation for the open house I am having pictures printed of our families, progress pics, and more to be on display. I've attached two pics that resulted in the aforementioned subject line because there are three answers I get to report to you. 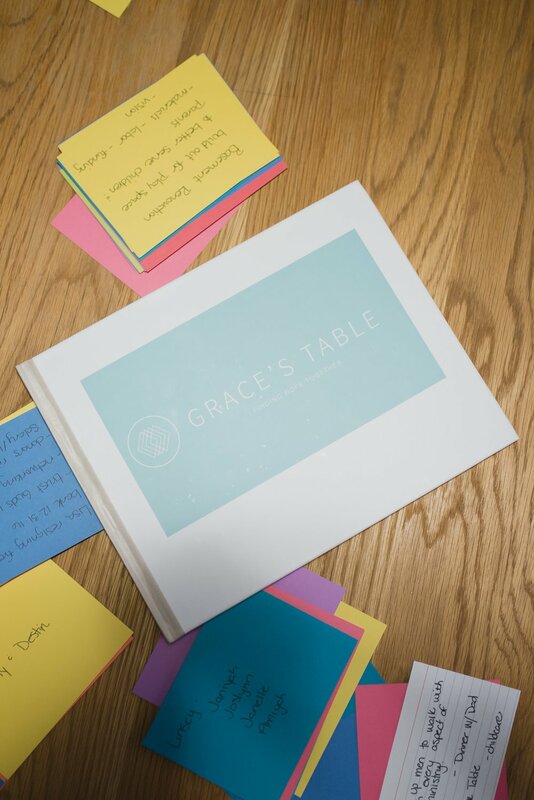 10 adults and a handful of littles gathered in August 2016 to pray together for the future of Grace's Table. 1. Lisa resigning from Bank of America. On October 31, 2016 I did just that. My first full day with Grace's Table was January 4, 2017. Notecards with prayer requests were placed on the table and one by one we prayed over them individually and together. 2. Basement Renovation - Frontline Bible Church was the first to come onboard. I believe this was before we even had the official drawings of the space. Since then God has brought on a Bruce Heys Builders, Lorenz & Co., Christ Church of GR, and the list goes on and on. And we are going to celebrate the heck out of what God is doing. We have raised north of 50% of what we need and God is continuing to knock it out of the park! 3. Three Board Members - God saw fit to bring on four in January 2017! Brian Burch (Burch Partners), Meaghan Miracle (Willis Law), Amy Butterfield (Plante Moran), and Wendell Anderson (Crossroads Community Church). He is growing us! I share all of this because it is important to not just pray, but give thanks, and I believe it encourages all of us to celebrate together. I hope this note is a reminder of God's goodness to you today. I also hope that you might have caught "all the feels" and squealed (or smiled) just a little. If you made it to the end of this please hit reply and tell me what God is doing in your life, how I can be praying for you, and if I will get to see you next week as we write messages of hope, scripture and prayers on the walls of this place you prayed into existence last summer. I hope you all were just as encouraged as I am rereading that message. Do you write down your prayers and also make note of when they are answered? Let's celebrate together! P.S. Please join us this Thursday, July 27 between 7:00-8:30PM for a sneak peak of our Room to Grow!